Quinn Rollins: Play Like a Pirate: Sidewalk Chalk -- Starting the School Year Right! 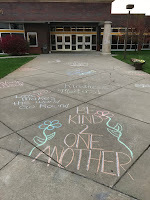 Sidewalk Chalk -- Starting the School Year Right! Most of us still have a few weeks before kids come back to school, but planning is ramping up. One of the great things about fall is that for a lot of us, fall is a last respite of good weather before snow comes in. Something I always try to do is find a way to use the outdoors while you've got it. And while the P.E. teacher in your building is probably doing that, there's no reason that you as a history, math, language arts, or music teacher can't use your school grounds too. 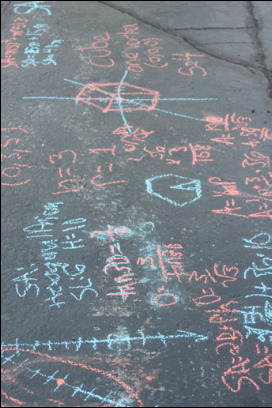 One of the easiest and cheapest and funnest (yeah, funnest) things to break out in the first weeks of school is some sidewalk chalk. This isn't a new or unique idea. There are a million ideas on Pinterest and edu-sites and even Crayola has a step-by-step lesson plan on Outdoor Geography. That's a good one to look at for some best practices before you take kids outside and turn them loose. 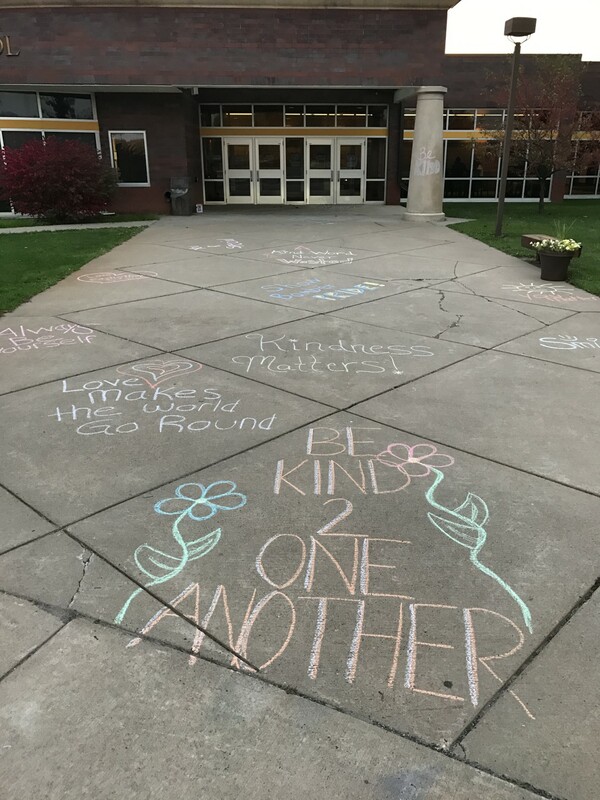 I love the idea of doing this in the first few days of the school year, when you're setting the tone not just for your classes, but for the entire campus. Decorating the pavement outside your building is a bold way of doing that. We see this often with elementary schools...but if you're a secondary teacher who just wants to spring your kids from the 7 hours in their desks they're going to have in that first week of school, do it. Middle school and high school kids love doing this too. Have students create a timeline of the span of what you'll be teaching in a history class this year. Break them up into groups, with each group finding the five most important events in that period. Students create an alternate cover for their favorite book. Have students choose a favorite scientist or invention, and not just illustrate it, but include their feelings about that invention in visual form. Be prepared for a lot of heart-eyed emojis. For elementary kids this one is easy -- anything from simple number lines to basic arithmetic to fractions. For middle school and high school...well...that's all on y'all. My math kind of fell apart after counting mittens and slices of pie. 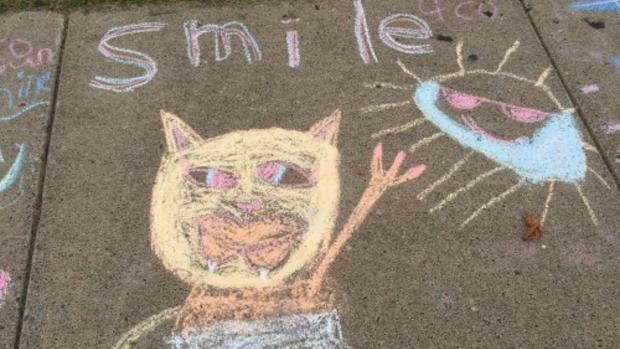 Have students illustrate their favorite song, or write out and decorate a favorite lyric. You guys should have better ideas than anything I could come up with. Ya hippies. Have kids find the happiest word they can, and make word art out of it. For German (my personal favorite and most beautiful of languages) I'd go for SCHMETTERLING (butterfly). Why not start the school year with communicable diseas--yeah, okay. That's a terrible idea. I'd start with healthy habits, and go from there. Start the school year with positivity. With messages that welcome kids back, and get them in the mindset that it's going to be a great school year, that have some pieces of content, that are something better and more exciting than reading your class disclosure and syllabus that first day. Principals -- most of us have those (often terrible)(not yours, if you're reading this) pre-first day of school faculty meetings. Take a 30 minute break from the paperwork and have your faculty write messages of positivity and hope and welcome. What's the thing they're most excited about this year? Have them get it on the school grounds. Remind us all that we have the best job in the world. Because we do. And it's starting up again.